LOS ANGELES, CA -- (MARKET WIRE) -- May 22, 2007 --Arena rock champions Buckcherry announced today they are teaming up with Hinder and Papa Roach for the "Bad Boys of Rock" summer tour, starting July 13 in Lansing, Michigan at the Adado Riverfront Park (complete itinerary below). Having traversed the globe for the past year in support of their current release "15" (Eleven Seven Music/Atlantic Records), Buckcherry are ready to fill stadiums luring fans with smash hits "Crazy B****," "Everything" and crowd favorite "Lit Up." The tour was secured when Buckcherry were recently honored by Hinder and Papa Roach for their 200th show and one-year anniversary of "15" in April at Buzzfest in Houston, TX. "Guaranteed to be slammin' -- the rock tour of the summer!" said Josh Todd. The two-time Grammy® nominee and gold certified rock underdogs Buckcherry have a new video for their current single "Everything" in rotation at VH1. The track just passed 2200 spins at radio and is ranked #7 at active rock and #7 at mainstream and going to Top 40 now. "15" has remained in the Top 200 since its debut in April 2006 and is certified gold. 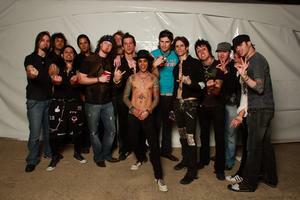 Buckcherry is Josh Todd (vocals), Keith Nelson (guitar), Jimmy Ashhurst (bass), Stevie D. (guitar) and Xavier Muriel (drums). Their most recent album is "15" (Eleven Seven Music/Atlantic Records). For more information go to www.buckcherry.com or www.myspace.com/buckcherry. Founded by Allen Kovac, CEO of 10th Street Entertainment, a leading music marketing and management company, Eleven Seven Music was developed in association with ADA, a Warner Music Group company, as an incubator label to develop bands for potential "up streaming" to the WMG family. Artists also include Buckcherry, Everclear, Drowning Pool, Marion Raven, The Exies and Jonny Lives! The label's inaugural release (Buckcherry's current album "15") features the smash hit single "Crazy B****" which earned a Grammy nomination from the National Academy of Recording Arts & Sciences® in the category of Best Hard Rock Performance. "15" is the band's first studio album in four years released in the U.S. in April 2006 with a debut at #2 on the Independent Album Chart.